The Three Outdoor Grills Worth Every Single Penny! Everyone loves a barbecue. What better way to enjoy a warm sunny day with friends than to have a cookout in the backyard or a local park. The smell of meat cooking over coals on a grill makes anyone’s mouth water with anticipation. However, getting a grill that will do the job, and not break the bank can be an uphill struggle as there as so many to choose from. Not to mention, the different cooking types that are available. We’re going to look at three great grills that work in outdoor locations that use three different cooking techniques. There are thousands of gas grills on the market, ranging from a few hundred dollars to many thousands. 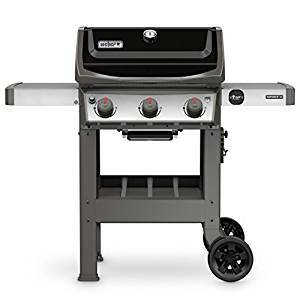 What makes for a good gas grill is one that has a surface area big enough to cook enough food for family and friends, and enough features to make it simple to operate, without becoming overburdened with gadgetry. Part of the fun of grilling is using your experience as a grill master to produce the perfect steak or burger, and you don’t want the joy of that taken away by an expensive grill that claims it can do it for you. That said, there are lots of mid-range gas grills on the market, with lots of great features. We’d like to highlight the Weber Spirit II E-310LP, which has features available on grills from other makers costing hundreds of dollars more. We’ll get to what makes it so unique in a moment, but before that let’s just look it over. The Weber Spirit II has a cart design with wheels, which means it can be moved around the yard or patio with relative ease. It has almost 530 square inches of grilling space, which is enough for a small family and friends. The cast iron cooking grates are porcelain coated to make more durable and more comfortable to clean. The cart design allows for storage of all the grilling tools you’re likely to need. The use of three burners means the cooking area is evenly heated, so your food will cook at the same temperature wherever they are placed on the grate. Modern Weber gas grills have a proprietary GS4 Grilling System, which makes the work of cooking on the grill so much easier. The system incorporates ideas to make grilling a total pleasure, including the Infinity Ignition System, which allows the cook to start one, two, or all three of the burners. Each burner can produce 10,000 BTU. The burners are protected by what is called ‘Flavorizer Bars’, the object of which is to spread the heat evenly under the surface of the grill. They are strategically placed above a grease management system to catch spatter and drips. This grease management makes cleaning the inside of the grill so much easier. Users report the grill heats up really fast and the ignition system is flawless. All-in-all you’re not going to get a gas grill with many of the features of much more expensive machines. In recent years, the Japanese style Kamado grill has become increasingly popular because of its undoubted versatility. 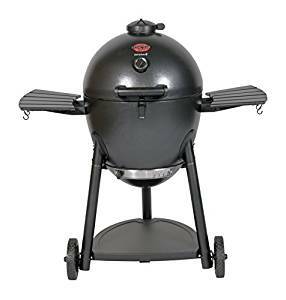 The idea of the egg-shaped Kamado grill was brought over to the United States by returning soldiers from WWII. They had seen the ovens in Japan and thought they would be great for barbecues. Since the turn of the century the Kamado craze has taken off big time, and there are lots of manufacturers offering products. 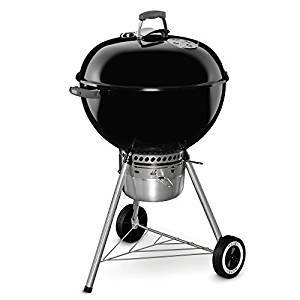 It started off with speciality manufacturers, and now some of the biggest names in outdoor grilling are producing models at reasonable prices. The Char-Broil Kamander Charcoal Grill offers the versatility of the Kamado grill with a price that won’t hurt your wallet. What makes it so special is the ability to control the heat inside the oven precisely enough to smoke meats over long periods, grill, or even cook a pizza in a matter of minutes. The Kamado-style grill uses a double-walled construction to keep the heat inside the grill and trap moisture, so the cooking is even and finished product is moist and not dried out. Because the heat from the burning charcoal is radiated back inside the grill the cooking is more efficient. By adding wood chips to the fire, smoke is trapped inside the egg-shaped dome of the grill, adding beautiful flavors to meat, chicken and fish. The Char-Broil Kamander is at the budget end of these grills but has all the features you require. The grill area of almost 470 square inches over two levels means there is plenty of room to cook for the whole family. The air intake at the bottom of the grill, along with the damper at the top, allows you to regulate the temperature inside the grill accurately using the thermometer on the face of the oven. Cleaning is easy with an integral ash pan that can be removed through the top of the grill. There is a folding side table for food preparation attached to the attached wheeled trolley for easy portability. If you are looking for a grill that does the job well, without any extra bells and whistles and won’t break the bank, then the original kettle grill from Weber fits the bill. The original Weber Kettle Grill has been around for more than sixty years and is the favorite of grillers all over the world. The significant advantage of the kettle grill is its portability at just 32 lbs (14kg). It can be carried in the bed of a pick-up or the back of an SUV to practically anywhere and has become the mainstay of many a tailgate party. OK, so it’s not the world’s biggest grill at just 360 sq inches, but it makes up for that in its versatility and affordability. On offer for less than a hundred bucks, you can’t go wrong with this classic. The damper vent on the top means you can regulate the heat inside, allowing it to be used as a barbecue smoker as well as a grill. As the grill has been around for so long, there are hundreds of accessories available to make grilling even more of a pleasure.